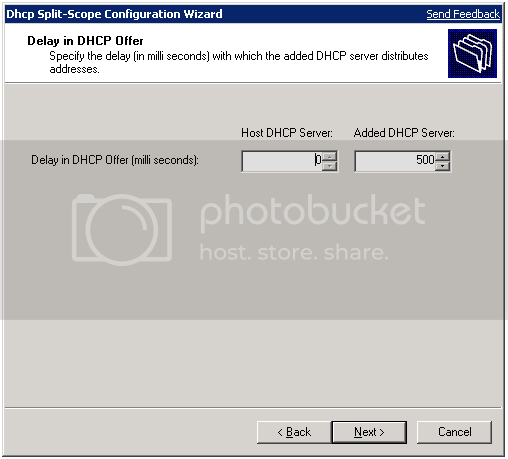 Split-scope configuration (Widely known as 80/20 Configurations) is typically considered as high-availability deployment scenario for the DHCP Server. It involves configuring scopes with the same subnet address and subnet mask and configuration on two distinct DHCP Servers. The two scopes have complementary exclusion ranges and therefore will not serve the same address to different clients. The ratio of address ranges across the servers is denoted as Primary Server to lease 80 percent of the addresses in the scope and the secondary server to lease out 20 percent of the addresses in the scope. Splitting a scope between servers in this way, which is commonly referred to as the "80/20 rule," often relies on the proximity of the DHCP servers to the clients it serves. To avoid address range exhaustion on the secondary (20% address range) server, it can be configured to send out the DHCP OFFER with a small delay as well. Press the next button on this screen to proceed. Add the secondary server in the edit box, if secondary server does not exist an error is displayed. It is only after having provided valid secondary DHCP Server one can click Next. Press next button to proceed. Adjust the split using the slider control; all other values are automatically adjusted OR the split can be configured with percentage field or IP Address range of the exclusion. Press next button to proceed. Specify the delay on the secondary server, press next button to proceed. This screen shows the selected configuration before you could proceed for split. Press next button after checking your configuration. Show the result of the split. 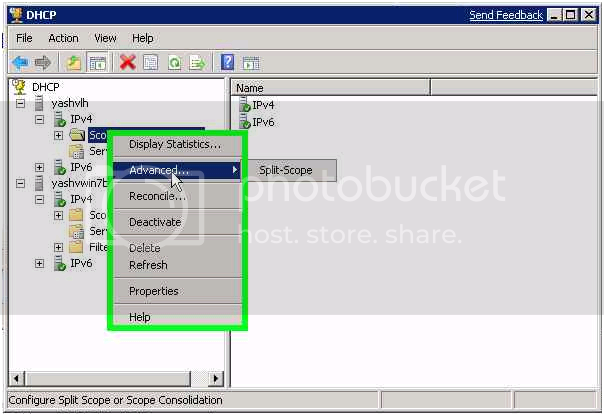 Hope this helps you in configuring the Split-Scope and manage the address effectively. Suggestions, comments and quries are welcome. Basically what needs to be synced is the configuration and the leases are never synced. So if you make new configurations on one server , you can create a netsh script of the configurations done on that server and apply it to the other server. It isn't possible to configure split-scope without UI. There should be no exclusion 10.0.0.121 – 10.0.0.200 on the second server. Please verify if there are vendor specific options configured for the scope which are not created on the secondary server . When you are using the split sciope feature , do you already have any existing exclusions on the scope for which you are trying to do split scope? Those exclusions too would be migrated . The exlusion ranges are on different dhcp servers. So an exclusion 20.0.0.1 20.0.0.80 is configured on the second server so that it does not give addresses from this range and only the primary (first) server services from the range 20.0.0.1 to 20.0.0.80. Similary exclusion 20.0.0.81 to 20.0.0.100 is configured on the primary so that it does not lease addresses from this range and only the second server leases addresses from the range 20.0.0.81 to 20.0.0.100 . When setup in a split scope configuration do Reservations/Options settings sync between the primary /secondary DHCP servers ? Subsequently when any changes are made on either servers are they synced between the primary and secondary DHCP servers? This functionality is available only on Windows Server 2008 R2. So DHCP2 in case of failure of DHCP1, it take care of full leased addresses ? it responsible only for part of the scope ? as at this case there is 80 users still they didn’t got DHCP IP ! That may be but I have set up the same setup on my Serv08 R2 DHCP servers. The same setup but with different IP ranges. The second DHCP server has the 2 exclusion ranges just like your example. When I stop the host DHCP server IP address handouts stop. The second DHCP server does not hand out anything as it is range excluded out of the scope. When I look at the host DHCP servers exclusions it only has the exclusions for the second DHCP servers range of IP’s not 2 lots as the second server does. With this default setup as created by the Split Scope feature the second DHCP server does not hand out IP’s when you stop the host DHCP. APIPA address are granted to hosts by themselves as they cannot get an answer from a working DHCP. Start the host and away it goes again. Delete the exclusion range on DHCP2 that corresponds with the host DHCP servers range and DHCP2 hands out addresses. If this is the correct way to set it up then I am missing something, can you please explain to me what I am doing wrong? Are we able to converse outside of this blog? thanks for the feedback. That is what I have done manually. So why does the DHCP Split Scope feature do this by default? 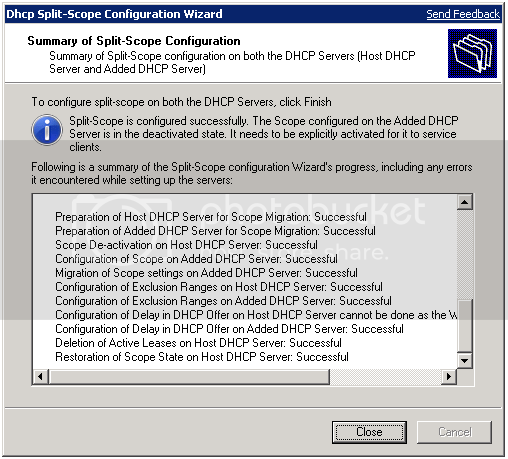 I have created various Split Scopes to test with various IP ranges and all of them by default in the second DHCP server included 2 exclusion ranges, one to exclude the Hosts range and another to exclude its own range. Is this a bug as I have re-created the problem over and over. If using this Split Scope feature you manually have to delete the exclusion range on the second DHCP server for it to hand out IP’s. Is this what is intended with the Split Scope feature as I cannot find any information on it at all. (1)Any plans on implementing this feature in the future? (2)If we need to manually sync do we backup the database and restore it on the secondary server on a regular basis using a script? Any info including a white paper on this? Wizard is for setting up split scope for the first time. For the above change, you will need to adjust the exclusion ranges on each DHCP server as per the 70/30 proportion. You will need to increase the exclusion range on the first server (80->70) and correspondingly decrease the exclusion range on the second server (20->30). Windows Server 2012 has a better high availability feature in DHCP server called DHCP Failover. You may want to take a look at that! During the first time setup of split scopes , the reservations and options do sync with secondary servers. However subsequent changes made do not sync and needs to be manually synced. great wizard, but wouldn’t it be easier to store the dhcp database in Active Directory and have a second dhcp server to distribute the adresses – as failover. I don’t see it mentioned in the article…which OS includes this functionality? Server 2008? Can you please explain why the second dhcp server has exclusion ranges of 20.0.0.1 to 20.0.0.80 and then a second exclusion of 20.0.0.81 to 20.0.0.100 out of its scope of 20.0.0.1 to 20.0.0.100.
would not this render the dhcp server unable to hand out addresses? it has exclusion ranges that cover the whole scope. when I configure a split scope, I try to go through the wizard and at the end I get an error. Error: 0x00004E2A – The specified option does not exist. My DHCP database was migrated from a previous win2003 machine. what should be the possible cause? unsupported DHCP option on R2? but the migration was successful, error only occur when i try to configure split scope. It is possible whitout wizard create or configure split scopes ? i have split scope of 80 addresses to 80/20…how do I re-adjust to 70/30? How to get back the slider ? Do I need to remove the scope on one DHCP side first and redo it again using the wizard ? 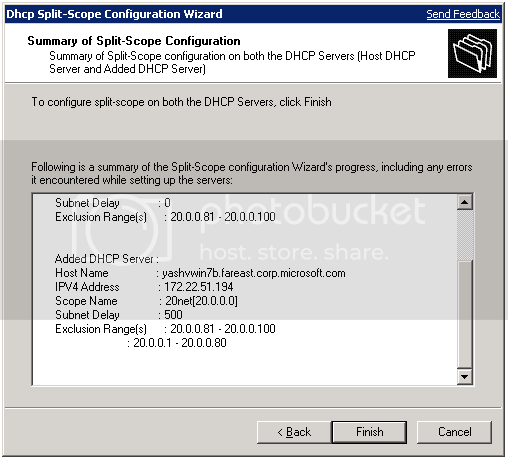 What changes would I have to make for the Split-Scope if I want to extend my DHCP Scope.